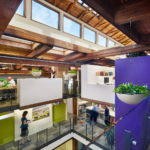 Thirty years after repurposing a circa 1880 sawmill on Pittsburgh’s North Shore for its offices, WTW has again transformed its workspace to express its culture and design philosophy in a highly collaborative environment that inspires creativity. 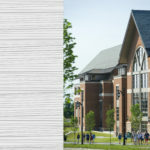 The Davis Student Center has become the hub of student engagement connecting the previously separate academic and residential campus districts. The sustainable design of the facility has led to a campus-wide commitment to sustainable practices in all aspects of University life.